Quentin Tarantino’s cast and crew left greetings to his editor in their work. The first subject in Anton Reicha’s Fugue No. 18 is a single note repeated 34 times. John Eisenberg, The Great Match Race, 2006. Nancy L. Struna, “The North-South Races: American Thoroughbred Racing in Transition, 1823-1850,” Journal of Sport History 8:2 (Summer 1981), 28-57. Paul E. Johnson, “Northern Horse: American Eclipse as a Representative New Yorker,” Journal of the Early Republic 33:4 (Winter 2013), 701-726. Katherine Carmines Mooney, Race Horse Men: Slavery and Freedom at the Nineteenth-Century Racetrack, dissertation, Yale University, 2012. Richard Nash, “Joy and Pity: Reading Animal Bodies in Late Eighteenth-Century Culture,” Eighteenth Century 52:1 (Spring 2011), 47-67. Michael S. Rosenwald, “Before Justify, There Was Eclipse and a Horse-Racing War Between North And South,” Washington Post, May 19, 2018. Oswald West, “Famous Horses and Horsemen of the Pioneer Period,” Oregon Historical Quarterly 46:2 (June 1945), 140-155. C.C. 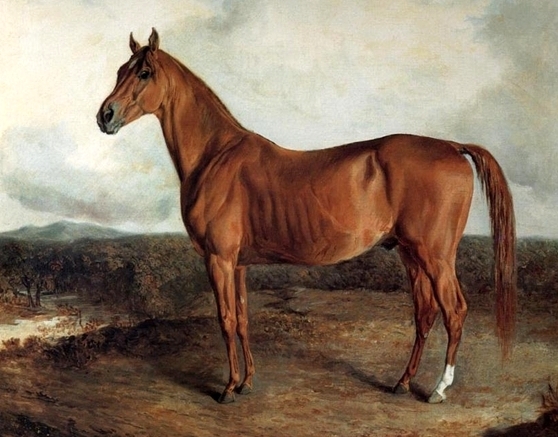 Colden, “The Great Match Race Between Eclipse and Sir Henry,” Frank Forester’s Horse and Horsemanship, 1857, 184-194. Max Farrand, “The Great Race — Eclipse Against the World!” Scribner’s Magazine 70:4 (October 1921), 457-464. “The Match Race,” The Port Folio 16:255 (July 1823), 81-83. W.E. Beard, “The War of the Roses,” Trotwood’s Monthly 3:2 (November 1906), 178-189. “The Running Turf in America,” Harper’s New Monthly Magazine 241:41 (June 1870), 91-97. Famous Horses of America, 1877. James Douglas Anderson and Balie Peyton, Making the American Thoroughbred, 1916. Kevin D. Lafferty, “Can the Common Brain Parasite, Toxoplasma gondii, Influence Human Culture?” Proceedings of the Royal Society of London B: Biological Sciences 273:1602 (2006), 2749-2755. Jaroslav Flegr, “Influence of Latent Toxoplasma Infection on Human Personality, Physiology and Morphology: Pros and Cons of the Toxoplasma–Human Model in Studying the Manipulation Hypothesis,” Journal of Experimental Biology 216:1 (2013), 127-133. Jaroslav Flegr, Marek Preiss, and Jirí Klose, “Toxoplasmosis-Associated Difference in Intelligence and Personality in Men Depends on Their Rhesus Blood Group but Not Abo Blood Group,” PLoS One 8:4 (2013), e61272. M. Novotná et al. “Toxoplasma and Reaction Time: Role of Toxoplasmosis in the Origin, Preservation and Geographical Distribution of Rh Blood Group Polymorphism,” Parasitology 135:11 (2008), 1253-1261. Jaroslav Flegr et al. “Neurophysiological Effect of the Rh Factor: Protective Role of the RhD Molecule Against Toxoplasma-Induced Impairment of Reaction Times in Women,” Neuroendocrinology Letters 29:4 (2008), 475. This week’s lateral thinking puzzle was contributed by listener John Levine.